Mike has been asking me to make a cold chicken salad for dinner. 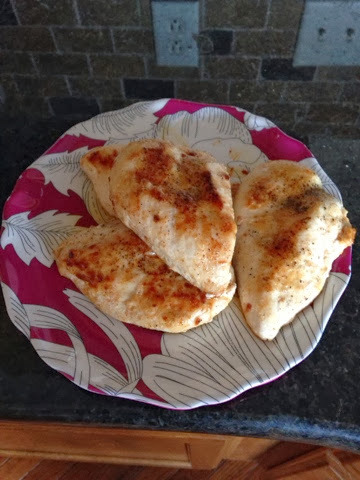 I read a few recipes and did some experimenting and I think I found something that we both really like. First I saute chicken in bacon grease. Yum already, I know. I season it with pepper, seasoning salt, garlic powder and onion powder. After it is cooked and cooled I chop it up into a little smaller than bite size pieces. 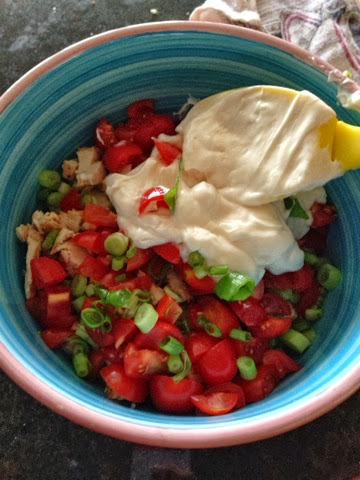 Then I add Mayo, celery, grape tomatoes and green onions. Grapes are a good add in too. You just have to eye ball the amounts until it suits your tastes. Mike likes it a bit heavy on the mayo. I then serve them in lettuce cups. This is a nice option if you want to make it ahead of time and just keep it in the refrigerator and take it out when you are ready to eat it. Here it is all in the bowl ready to be mixed up.